1. 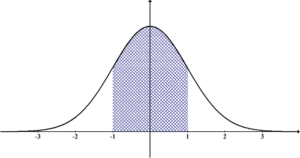 The normal curve is “bell-shaped” and symmetrical in nature. The distribution of the frequencies on either side of the maximum ordinate of the curve is similar to each other. 2. The maximum ordinate of the normal curve is at . Hence the mean, median and mode of the normal distribution coincide. 3. It ranges between to . 6. The first and third quartiles are equidistant from the median. Also read: How to check Multivariate normality using R? The following table gives the area under the normal probability curve for some important value of Z. 9. All odd moments are equal to zero. 10. Skewness = 0 and Kurtosis = 3 in normal distribution. Subscribe SAR Publisher and give your feedback, suggestions in the comment section. ← What is Hypothesis? What are its types and characteristics?